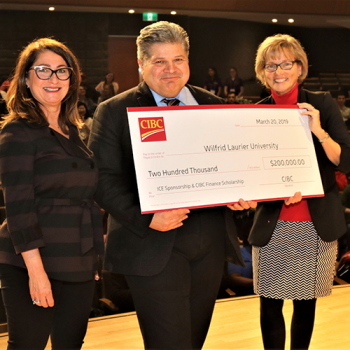 Waterloo – CIBC has pledged $200,000 over four years to Wilfrid Laurier University, providing outstanding learning opportunities for students in the university’s Lazaridis School of Business & Economics. Half of the funds will support new scholarships for women studying finance. With the other portion, CIBC becomes title sponsor of the Lazaridis School of Business & Economics’ innovative immersive learning vehicle, the Integrated Case Exercise (ICE). The announcement was made at the March 2019 Winter ICE kick-off event at Lazaridis Hall on Laurier’s Waterloo campus. ICE is a unique, 42-year tradition at Laurier. During this 10-day compulsory case study competition, offered two times a year, more than 900 third-year Bachelor of Business Administration (BBA) students analyze complex problems facing real companies and then compete in teams to present the best solutions to top business executives. Companies analyzed in the past include Linamar, Blackberry, Molson Coors Canada and the Stratford Festival. CIBC’s gift of $25,000 per year for four years will provide $100,000 to support the next eight ICE competitions (one each year in winter and spring). The bank is also committing $100,000 over four years to strengthen the role of women and women-identified persons in the finance industry and academia through the CIBC Finance Scholarships. Five annual, one-time scholarships of $5,000 each will support women in the upper years of the BBA program who are also enrolled in the Finance Option. CIBC has a lengthy giving history to Laurier, with major gifts supporting Library renovations, the Laurier Launchpad $50K Venture Creation Competition and the CIBC Leaders in Entrepreneurship Award, as well as gifts supporting many other projects and programs across Laurier’s Waterloo and Brantford campuses. CIBC employs 238 Laurier alumni, with several alumni who have been in top executive roles over the years, and has hired students for a total of 246 co-op work terms (including at CIBC World Markets and CIBC Wood Gundy). Wilfrid Laurier University excels at educating with purpose. Laurier’s holistic approach to learning integrates innovative programming with hands-on experience outside the classroom to ensure Laurier graduates are not only ready for the real world but are inspired to leave their mark on the world. Community is at the heart of all we do. Laurier inspires students to engage in campus life and the broader community, leading to high levels of student satisfaction and engaged alumni who carry the Laurier legacy throughout the world. As a community of researchers, leaders and educators, Laurier builds knowledge that serves society and creates connections that have a lasting impact. Learn more about Laurier’s 19,000+ students in nine faculties in Waterloo, Brantford, Kitchener and Toronto at wlu.ca.